Hebrew novelist and journalist; born at Wilna, Russia, 1851; died in Vienna Oct. 18, 1902. Educated on the usual Talmudical lines, he came early under the influence of the Maskilim. In 1868 Braudes became a contributor to "Ha-Lebanon" ( ), a Hebrew weekly published by Brill in Mayence, and for several years he devoted his pen to topics of the day and to criticism. It was as a novelist, however, that he was to make a mark in Hebrew literature. In 1874 he published in "The Dawn" ( ), a monthly edited by Smolenskin at Vienna, his first story, entitled "The Mysteries of the Zephaniah Family" ( ), a tale of great promise from its style and vivid descriptions. The next year appeared his second novel, "The Repentant" ( ), which was followed by one entitled "Religion and Life" ), treating of Jewish life. This remarkable work was published in "The Morning Light" ( ), issued by Gottlober at Lemberg in 1875. 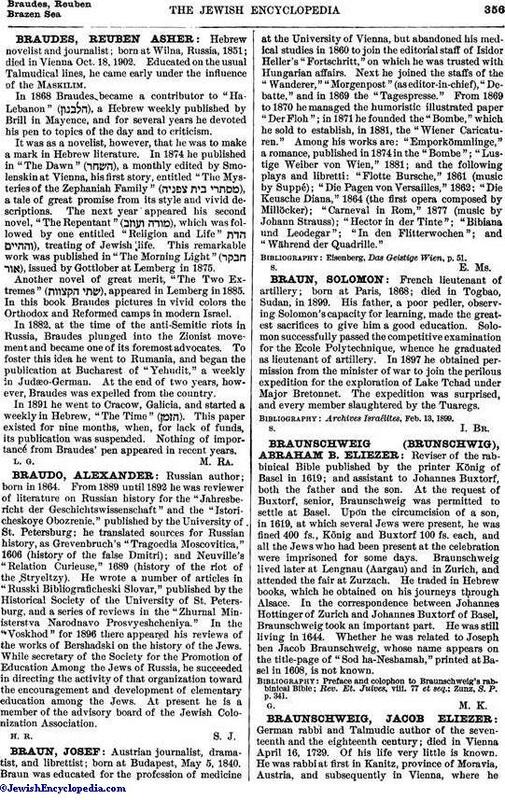 Another novel of great merit, "The Two Extremes" ( ), appeared in Lemberg in 1885. In this book Braudes pictures in vivid colors the Orthodox and Reformed camps in modern Israel. In 1882, at the time of the anti-Semitic riots in Russia, Braudes plunged into the Zionist movement and became one of its foremost advocates. To foster this idea he went to Rumania, and began the publication at Bucharest of "Yehudit," a weekly in Judæo-German. At the end of two years, however, Braudes was expelled from the country. In 1891 he went to Cracow, Galicia, and started a weekly in Hebrew, "The Time" ( ). This paper existed for nine months, when, for lack of funds, its publication was suspended. Nothing of importance from Braudes' pen appeared in recent years.